TORONTO -- There wasn't a dry eye in the house as 19,439 watched Darryl Sittler's jersey raised to the Air Canada Centre rafters. It was Sittler's words that caused the sentiment. Barely holding his emotions in check, he told the crowd not only his name, but also that of his late wife, Wendy, was going to be enshrined in banner form for all-time. Wendy Sittler, his wife of 30 years, died 16 months ago of colon cancer. Sittler's No. 27 was to be honoured last season, along with Frank Mahovlich, but that ceremony was delayed because Wendy was suffering through her ordeal. Just three days after Mahovlich was recognized, Wendy succumbed to her illness. Darryl Sittler and his family stands watching his No. 27 raised to the rafter at A.C.C..
Sittler made a passionate dedication to his wife before his jersey was raised, standing arm and arm with his three children, Ryan, Meaghan and Ashley. "I know that her big warm, beautiful smile is shining down on us," Sittler said. "I'm honoured that you are here to share this with me and my family. The greatest honour a player can have is to have a banner raised by the organization." The crowd gave their full support to Sittler with a two-minute standing ovation upon his introduction and remained on their feet throughout his speech and as his No. 27 was hoisted above. Not only did the fans show their appreciation, but the Leafs themselves weren't about to let the night go down with a less than stellar effort, trouncing the Montreal Canadiens 3-1. Ed Belfour, who just missed his second consecutive shutout after a late third period goal, was moved by the ceremony and it made him be proud to be part of the Leafs' organization. "It was real emotional. It's nice to be a part of. 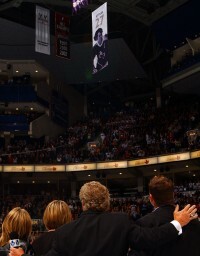 Watching that banner go up, it really sinks in how great it is to be a Maple Leaf," Belfour said. Even head coach Pat Quinn could feel the atmosphere in the building. "I thought it was marvelous. For Darryl to speak with all that kind of emotion going on was incredible," Quinn said. Sittler served as Leafs' captain from 1975-1981 and he knows what it's like for Mats Sundin, who scored two goals en route to victory. The Super Swede has good relationship with Sittler and welcomes his advice. Standing watching the ceremony from the ice, Sundin was caught up in the event. "You are in awe of a player like Darryl Sitter," Sundin said. "With the adversity his family has been through over the past few years it was emotional to watch and great to be a part of."